What Makes a Great Pool Design? There are many descriptive words used to define pool types—traditional, modern, freeform, geometric–the list goes on and on. When asked to comment on the quality of a pool’s design, however, the choice of adjectives drops significantly. There are poorly designed pools, well-designed pools and artistic pools that epitomize the design process. It helps to realize that the discipline of pool design and the fundamental concepts upon which it is judged are inherently parts of a larger whole—the field of design in general. While what qualifies as art is rather subjective, there are elements that define good design. Painters, sculptors, interior decorators, architects—all artists—follow the same basic principles. Pool builders should be no different. By familiarizing yourself with the factors and standards that ultimately determine the quality of a pool’s design, you will increase the likelihood of having a piece of liquid art in your own backyard. There is no substitute for experience when building a pool; however, the more educated a builder is on the theory of design, the more probable that all aspects of the creation will be cohesive and appropriate. Without a firm understanding of the elements of design, such as color, line, contour, texture, balance and rhythm, it is difficult to compose a truly artistic poolscape. 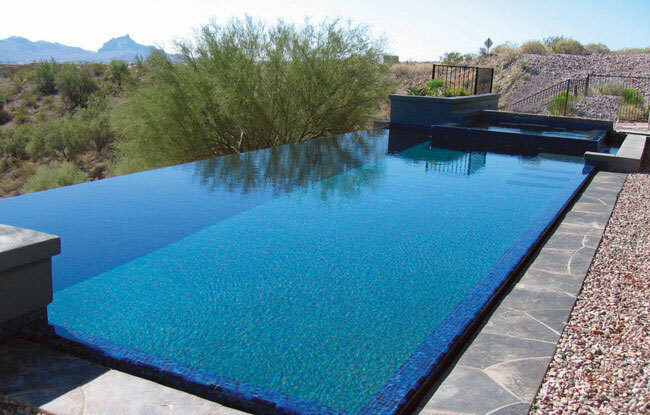 A good designer also realizes that a pool needs to be just as functional as it is aesthetically pleasing. “Often, what separates wonderful water art from the ordinary are proper construction techniques and uncompromising standards concerning all mechanical components,” notes watershaper David Tisherman of David Tisherman’s Visuals, Inc., Manhattan Beach, CA, and of Liquid Design in Cherry Hill, NJ. Thus, the best designers are often trained in structural engineering or have counterparts with whom they can consult on the subject. This is a notable point. Despite the knowledge and training of the pool builder, projects are a reflection of the client’s preferences. Builders are doing a job, and in the end, the paying customer has the final say. The involvement of the client, along with his or her level of sophistication, education and exposure to art certainly impacts the design process. For this reason, a designer’s flexibility and versatility is invaluable. The mindset of all those involved should be open to change and compromise, approaching the pool as a work in progress that is constantly evolving. Put simply, sketching a layout, digging a hole in the ground and pouring some concrete doesn’t remotely resemble the work of a Luxury Pools’ builder. While many may be able to handpick a poorly designed pool from a well-designed one, it is far more difficult for someone without adequate training to differentiate between decent design and excellent design. Painstaking attention to detail is often the tell-tale sign. Tisherman also subscribes to this school of thought. “The pool itself is not the most important element of the design,” he shares. “A pool is nothing more than an odorless, colorless, highly reflective body that mimics the environment in which it is placed.” Therefore, as a mere component of its surrounds, every choice that is made counts. Creativity, indeed. Close analysis of details spurs the challenge of conventional methods and creates more appropriate alternatives. Great pool designers do not make their decisions because something has always been done in a given way. For example, just because a pool’s spa traditionally has six to eight jets does not mean that all pools’ spas should have the same number, the same configuration, the same look or the same feel. While groupings of climbing moss and wild flowers may lend themselves to a pond-inspired pool, they do not necessarily belong around a modern-style aquascape. This concept of specificity should apply to every element of the pool since each project is unique. In the end, nuances matter. When something is well-designed, it speaks for itself. Sometimes clients want it all—waterfalls, slides, statues—you name it. While it is the pool builder’s job to give paying customers what they want, it should also be his or her responsibility to steer them in the right direction—in the direction of simplicity and unity. “All too often we see a tendency to add more than necessary hardscaping around a pool,” notes Hess. Of course, this is not to say that a spacious decking area cannot be useful. Rather, it is the way the area is designed and its use of space that is important. “An expansive terrace that has no breaks for planting pockets can create spaces that feel uncomfortable and may even cause jarring sun glare. Clients then feel compelled to fill the space with an overabundance of furniture and other odds and ends to create intimacy,” Hess explains. Instead of more furniture, he recommends landscaping. Placing a small tree adjacent to a terrace area may provide the perfect finishing touch. Not only does it add purpose by providing shade, but it also softens the hardscape. All good designers, regardless of their medium, are strong proponents of balance and the principle that the whole is more important than any one piece of the puzzle. If one element is too overpowering, the overall effect is lost. While the same holds true in the art of pool building, people with an untrained eye are usually most impressed with projects that feature all of the bells and whistles. In reality, however, pools that pack in too many “special features” lack restraint and create visual discord. Properly designed poolscapes do not require observers to cut through the clutter to appreciate the larger picture. There is a reason why unity, cohesiveness and synergy are favorite words in the world of design—all of them help define good technique. So, regardless of your taste or the style that you gravitate toward, the key to achieving a true work of water art lies in the knowledgeability and skill set of the artist, the effective collaboration among client, designer and builder, and the ability to compromise a part for the whole. Last, but certainly not least, remember that good design lies in the details.